Hotel Pomra is centrally located just minutes from the Royal Palace , Secretariat , Assembly House and the more recent attractions the Ropeway , Flower Exhibition , Ridge Park .The full service hotel and well trained staff have only one focus to make your stay wonderfully exotic and extraordinarily comfortable all with the inimical style and mystique of this"Hidden Paradise". Its close proximity to the site of various tourist interest and unique ambience is very inviting for those who are looking for comfort, convenience and traditional hospitality with care. 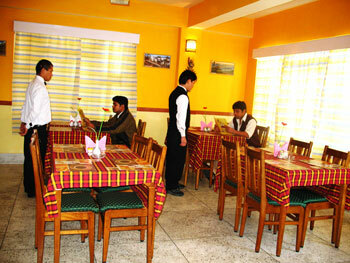 One can avail off all the amenities and facilities during their stay with us in our part of the world. Hotel Pomra comprises of 14 well appointed and comfortable rooms with all modern amenities and facilities including wifi internet connection. A combination of classic styling of the yester years are the hallmark of our hotels room. All the rooms are fitted with modern accessories and furniture and are decorated with wall paintings. Comfort with elegance is offered in every room at Hotel Pomra. Travel Counter, Airport Transportation, Room Service, Laundry Facilities, Breakfast Services, Doctor on Call, Security Guard, Currency Exchange, Parking, Backup Generator. Toothbrush/Razor on Request, Air Conditioning Room, Attached Bathroom, Wakeup Calls, House Keeping, H/C Water, Cable/Satellite TV, Iron/Ironing Board, DVD Player. User reviews for "Pomra Hotel Gangtok"